Welcome to Ron Gordon Watch Repair. My workshop is conveniently located in Midtown New York City. My shop is equipped with modern state of the art machinery to handle all phases of watch repair, water resistant testing and case and bracelet refinishing. I have over 30 years of experience and knowledge with the tools to do the job right. All work is done in house. The watch is reassembled, oiled and regulated. 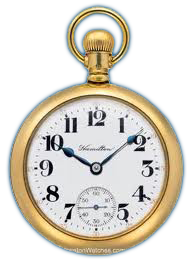 If you own a vintage Hamilton watch and wish to have it repaired, call or email me, and I will be glad to answer any of your questions regarding watch repair or service of these exceptional timepieces! We at Ron Gordon Watches also repair other vintage watch brands such as Waltham, Elgin, Gruen, Howard, Illinois and South Bend to name a few. If you are a lover of vintage watches, please reach out to Ron Gordon, personally, to repair your beloved timepiece! A little history about midtown Manhattan, specifically the first-ever celebration of New Year’s Eve in Times Square. This inaugural bash commemorated the official opening of the new headquarters of The New York Times in midtown Manhattan, New York City. The newspaper’s owner, German Jewish immigrant Alfred Ochs, had successfully lobbied the city to rename Longacre Square, the district surrounding his paper’s new home, in honor of the famous publication (a contemporary article in The New York Times credited Interborough Rapid Transit Company President August Belmont for suggesting the change to the Rapid Transit Commission). The impressive Times Tower, marooned on a tiny triangle of land at the intersection of 7th Avenue, Broadway and 42nd Street, was at the time Manhattan’s second-tallest building — the tallest if measured from the bottom of its three massive sub-basements, built to handle the heavy weight demands of The Times’ up-to-date printing equipment.